Natural pontiff of Tuscany, secular name Hildebrando of Cluny, born about 1013 and died in Rome of May 25, 1085. Acclaimed as Pope since 1073, is without doubt one of the pontiffs most controversial in the history of the Church. The turbulent times that was live and their intransigent attitudes has been a breeding ground for controversy, both his contemporaries and historians almost to the present day. His detractors are baited in their physical, social and moral figure. By your little physical poise will say of him that was "low ventrudo and cuellicorto". His enemy Benzo of Alba says that he/she was a commoner born in Soano Tuscany, 'natus suburban matre, de patre caprarius'. Emperor Henry IV shall crossed out his staunch opponent of "false monk" in an insulting letter in 1074. Supporters, on the other hand, will present him as the son of a member of the Roman nobility and paradigm of virtues: Mystic, reformer, lover of Justice and with little attachment to power. The exaltation of the character formalize from the Counter-Reformation: in 1583 was introduced in the Roman martyrology; her canonization would arrive in the 1606 and, finally, her feast would be extended to the whole of Christendom by Pope Benedict XIII in 1728. Her feast is celebrated on May 25. Hildebrando life until his enthronement as Pope is a man who develops an extraordinary activity. Undoubtedly, its harmony with the monastic ideals booming: educating child in the convent of Santa María de el Aventino and maintains a good relationship with the Cluniac monks later (see: order of Cluny). Doubts, however, if you came to profess in the order as he/she expressed his Bonizon of Sutri follower: "monachus effectus est". We know, Yes, his performance as Treasurer of the monastery of San Pablo in Rome in the early fifties of the 11th century. Hildebrand will be efficient contributor of various popes committed to the ideals of regeneration of the Church (Leo IX, Nicolás II, Alejandro II...) Practiced Pontifical legacy, Archdeacon of Rome in 1058 and, above all, meticulous investigator in the Roman and Italian files. This work allowed the collection of letters, recovery of patristic texts semiolvidados, exhumation of canons of old councils, etc., all basic parts them to strengthen this reform of the Church which has given name but which also helped other less vehement characters who have been unfairly overshadowed by the same token, (see: Gregorian reform). Tradition speaks of his exaltation to the papacy to the death of Alejandro II popular outcry. The voice of "Hildebrando papa!" the people of Rome forced the Cardinals to the designation of who, Archdeacon at the time, he/she was ordained priest and consecrated Bishop of the eternal city in just seven days. 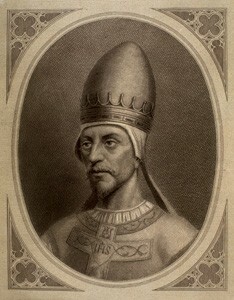 It would take the name of Gregory (VII), which enjoyed a well-earned reputation in the list of Popes. Gregorio VII, the church reform measures just confusing with the centralization, a gigantic task for which the Popes did not even with sufficient means and with the opposition of important forces of varied sign. From the point of view of moral regeneration, Gregorio VII does not but deepen the policy of his predecessors: fight the cohabitation of clerics (did) and the merchandise of Church positions (Simony). Letters to bishops and rulers and the synods gathered under its initiative (such as the Lenten 1074) stressed the measures against the unworthy church ministers, who is threatened with losing its offices. Like its predecessor, Gregorio VII expressed for some time his sympathy for a popular reformist movement: the Milanese pataria fighting also, often mob, for the eradication of ecclesiastical vices. The various testimonies speak of a Gregorian policy aimed to limit the jurisdictional role of primates and metropolitan which, with its enormous power, had given the image of a church similar to a Federation of ecclesiastical provinces. The Bishops will be the basic part of an institutional mechanism to which you want to submit to surveillance of a Pontifical power which, depending on its origin, is the only one that can be considered universal. The Dictatus papae, promulgated in 1075, worked in that direction. And also in the place the authority of the Pope over the different temporal powers, including that of the emperor. Little touch in the implementation of certain decisions led to serious setbacks. They were many, in fact, interests (both secular and clerical) affected by the papal policy. To sum up this problem: Gregorio VII is the Pope, where the most apologetic tradition, would have the courage to face a simoniac and dissolute Felipe I of France. It is the Pope who maintains differences for ecclesiastical benefits provision in England with the pious but brutal Guillermo I, though without reaching an irreparable rupture. It is the driver of the liturgical reforms in Spain despite the resistance of the clergy of the Mozarabic rite and some monarchs who recalls a few vague rights of Papal sovereignty over the Iberian territory (June 1077). He/She is the protector and organizer of young christianities (Croatia, Bohemia, Poland, Hungary) turned in some cases in tax from the Holy See. It is one of the precursors of the idea of crusade, which materialize in 1095 one of his successors, Urban II. And Gregorio VII is, above all, the Pope with harsh reality becomes a medieval policy constants: the confrontation between papacy and Empire (see: war of the Endowment). The shock would start from 1075 when the young German monarch Enrique IV, expressed their discomfort by the decrees of the Roman Synod of that year against lay investiture that the reformers assimilated to Simony. The sovereign had the support of a sector of the High German and Italian clergy who felt handicapped in their interests by the Pontifical measures. The escalation of grievances would be unstoppable and dramatic consequences. After a pungent mixture of missives, Enrique was anathematized and deposed by Gregorio VII. Only agreed to lift the excommunication after the humiliating pilgrimage of the monarch and his wife (January 1077) to papal refuge of Canossa, the Apennines fortress owned by the Countess Matilda of Tuscany, determined protective of the Pontiff. Reconciliation was short-lived, since the Pope refused to overrule the domestic enemies of the monarch who had taken advantage of its recent difficulties to take up arms against their authority.For several years, Germany was burnt in a civil war in which Gregorio VII failed to enforce all the weight of its moral authority. In the Lenten Council of 1080 it struck a new anathema against Henry and his supporters. With the collaboration of a number of prelates, the sovereign appointed the Archbishop Guido de Ravena who took the name of Clement III Pope (antipope in the official relationship of Popes). The imperial troops fell on Rome that Gregorio VII managed to flee with the help of his Norman allies from the South of Italy. (March 1084). The following months would pass them the pontiff sought refuge at Salerno, with its legitimacy in question. He/She died May 25, 1085, according to tradition pronouncing a phrase extracted from the book of Psalms, "for having loved righteousness, and hated iniquity, to die in exile". Harvested in the last moments of his life by Gregorio VII personal failure was its rival Germanic a Pyrrhic victory given the true political ordeal which suffer until his death twenty years later. The gregorianismo torch would be collected by Hildebrando successors who, through a more pragmatic and temperate, would achieve some of the objectives pursued. ARQUELLIERE, H. X.: Grégoire VII. Sur Essai formation d´une Théorie juridique. Vrin. Paris 1942. CAPITANI, o.: The Riforma della Chiesa (1012-1122). Patrone Editore Bologna 1984. PAUL, j.: The Church and culture in the West (9th - 12th). Work. Col. New Clio, 2 vols. Barcelona 1988.